Electric Assisted Vehicles Limited have assembled a team of highly qualified and experienced engineers from the automotive, motorsports and aerospace industries in order to produce a ‘culturally focused' solution to sustainably disrupt the way products and services are moved. Their approach has been to conceptually ‘engineer down' from current Light Commercial Vehicles rather than ‘engineer up' from the humble bicycle to transform urban mobility for the better. In doing so, operators of the P1 will still find many of the elements of using a van they're used to but with the immense efficiencies and zero emissions of the eCargo bike. Nigel Gordon-Stewart, Managing Director of EAV. "We've created a vehicle with Project 1 that will lead on to an entire range of mobility solution vehicles. All highly functional, exceptionally environmentally aware, easy and great fun to use. Also, they have to be very cool to look at which is another crucial cultural point." The result is a quiet quadracycle that is peddled and steered just like a traditional bike. It has a thumb switch to accelerate up to 6mph after which simply turning the crank by peddling provides electric assistance to tackle the longest journey or significant slope with ease and with completely zero emissions. It's narrow enough to fit down and cycle path and can hold, in short wheelbase form, six cargo containers with up to a 150kg payload at one time on a completely stable platform. The technology and engineering of the vehicle was developed by EAV with design partners New Territory responsible for its appearance. It's compatible with all charging stations but the battery packs are removable for charging and replaceable, not only for operational efficiency, but also for battery technology developments which are continuously improving. EAV has developed the P1 alongside the UK's leading parcel delivery group, DPD. 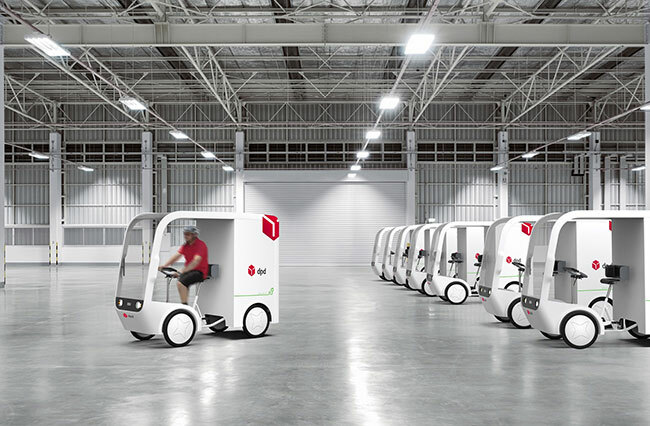 The parcel giant, which launched the UK's first all-electric parcel depot in Westminster in October and is spearheading the introduction of zero emissions vehicles in the UK, has worked with EAV from the outset as technical partner. Dwain McDonald, DPD's CEO commented, "EAV is an incredibly innovative company and it has been fantastic to work alongside a British manufacturer to create such a highly customisable solution. Our aim is to be the most responsible city centre delivery company, which means neutralising our carbon footprint and developing smarter, cleaner and more sustainable parcel delivery services. Not only does the P1 look amazing, it is also incredibly smart, flexible and future-proofed. As a result, the P1 is perfect for UK city centres and we are really looking forward to adding it to our rapidly expanding zero emission fleet in July." Adam Barmby, founder and technical director at EAV commented: "We would like to re-educate the population on common sense vehicle design and intelligent methods of mobility that deliver a sense of purpose and place for urban populations. We're already thinking on how we can extend the technology for other uses. For example, the chassis design is modular, so we can extend, widen, or shorten the P1 for multiple applications. Full weather protection is also in development for year-round use in almost any climate or city location worldwide. Part of our business model is to make the P1 a rentable vehicle for the gig economy with an App operation for entrepreneurs so they can use it for their own businesses. We're also looking at the P1 concept's ability to carry passengers and we're keen to work with the Department for Transport and Transport for London in order to evolve the regulations for this zero emissions solution for future urban mobility." Nigel Gordon-Stewart, Managing Director of EAV added: "It's an exciting time to be involved in e-technology and we're mindful of addressing the wider cultural changes that are needed as well as the emphasis on zero emissions. We have to try and make transport as close, in many ways, to how it is now but also significantly shift away from what we're all used to. Loading a generic van up with batteries isn't really the answer as it's just more weight to carry. We need to think more about how we travel, why we're travelling, when we travel and what we travel in - just for a short while until it becomes as second nature as what we have now. ULEZs and ZEZs will justifiably force the speed of the change on us but it doesn't mean that mobility should lose its appeal, easy functionality or fun, it's just going to be different, and rightly so. “As a business, our focus now is on developing the Project 1 platform as well as attracting investment and we've applied to HMRC for SEIS/EIS Advanced Assurance which we're hoping will help in making e-Mobility and EAV an even more attractive investment opportunity."